Grim Tales: The Vengeance Collector's Edition is one of the recently released hidden object puzzle adventure games. The story of the game has a lot of turns and the destiny of your nephew depends on you and your supernatural power. Expect a lot of hidden objects scenes and puzzles. The HOS are mostly lists with some interactive elements. You participate in the trial of your nephew who is charged with murder of his sister. You and your special power can help your nephew and find out the real murderer. You can find out history behind objects and you intend to use that to see the truth. But you need to be careful and not become a victim yourself. The game's graphics are crisp and colorful. All the details are clearly seen. The sounds and music match the scenes and the atmosphere a lot. Expect a lot of hidden objects scenes and puzzles. The HOS are mostly lists with some interactive elements. Both kinds of tasks are somewhat challenging and make you think. Sometimes you get a tutorial window pop-up in case you need help with something. 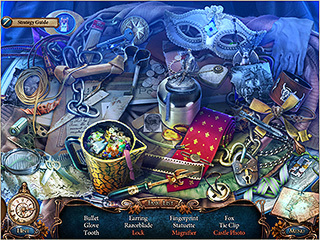 There are several collectibles, morphing objects and achievements throughout the game. There is a map to transport you where you need as well as a hint system that helps you find your next location. 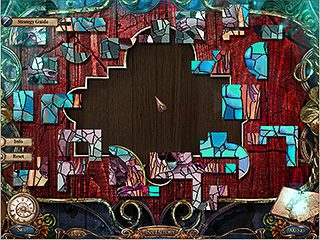 The game is full of discovries and puzzles to make you think and wonder what's next. This is Grim Tales: The Vengeance review. Download this game here.